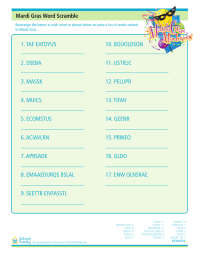 Celebrate with Mardi Gras worksheets, including coloring pages, word searches, crossword puzzles, writing prompts, math worksheets, and more. During Mardi Gras, people often celebrate by wearing costumes and masks, and attending masquerade balls. If you were to attend one of these balls, what would your costume look like and why? 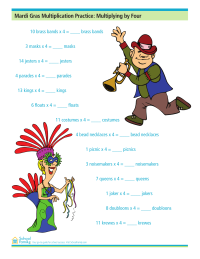 Practice single-digit subtraction with this Mardi Gras-themed math worksheet. 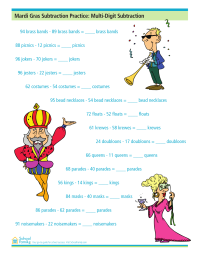 Practice multi-digit subtraction with this Mardi Gras-themed math worksheet. 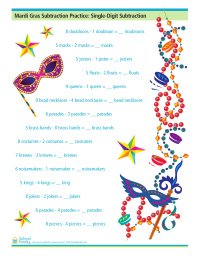 Practice multiplying by four with this Mardi Gras-themed math worksheet.